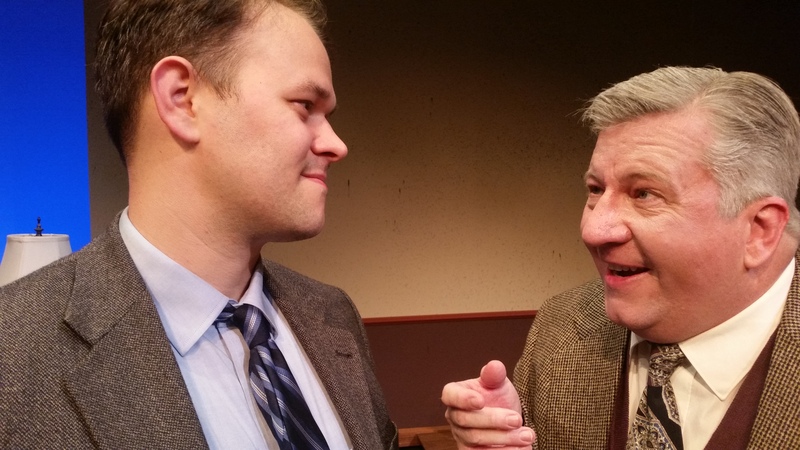 Zac Taylor and J.R. Stuart in Tuesdays with Morrie. Photo courtesy Bunbury Theatre. Mitch Albom’s book Tuesday’s With Morrie told of the renewal of a friendship with one of his college professors in the months before the old man dies from ALS. It was a bestseller and popular television movie, and it remains an appealing inspirational story. 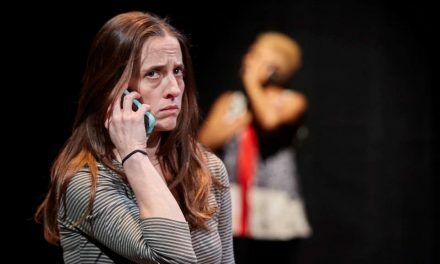 The stage adaptation, by Albom and Jeffrey Hatcher, keeps the schmaltz at bay for most of its length with humor grounded by J.R. Stuart’s performance in the title role. Reunited sixteen years after graduation, Mitch (Zac Taylor) is a busy sportswriter whose competitiveness has led to success but not happiness. He was close to Professor Morrie Schwartz (Stuart), whose mentorship is characterized by compassion and a New Age humanism. Morrie has gained a degree of fame after being profiled by Ted Koppel on Nightline, and Mitch works to overcome his guilt at neglecting the friendship through visits every Tuesday. It is a simple, tw0-character interaction, staged with attention to detail in the design work, particularly in the subtle lighting design by Gerald Kean. Morrie’s “lessons for one” is chock-full of homilies dropped like one-liners, and Stuart’s instincts as an actor are so sure and true that he maintains his expert comic timing even amidst the sentimentality. Zac Taylor is sincere and heartfelt as Mitch, but Morrie is what matters. 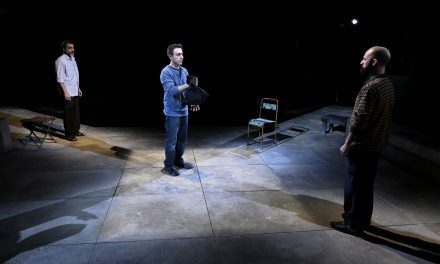 As a director, Stuart makes certain the audience connects with Morrie as just as Albom did, which means he allows his own performance to dominate appropriately. As Morrie deteriorates, Stuart never overplays the exigencies of the disease but delivers enough realism to register recognition in the audience. For me, as drama, Tuesdays With Morrie goes a step too far in milking the sentimentality, but if, as a memoir, we accept Albom’s account as honest and heartfelt, then this is nothing less than a love story, so perhaps the emotional intimacy is exactly right. And there is a solid foundation in Morrie’s lessons. In the face of his imminent demise, the two men discuss mortality, with Mitch ill at ease but Morrie almost welcoming it with no regrets: “Taking makes me feel like I’m dying, giving makes me feel like I’m living.” Morrie never stops giving, and who can argue with that? Keith Waits is a native of Louisville who works at Louisville Visual Art during the days, including being the host of LVA’s Artebella On the Radio on WXOX-FM 97.1/ ARTxFM.com, but spends most of his evenings indulging his taste for theatre, music and visual arts. 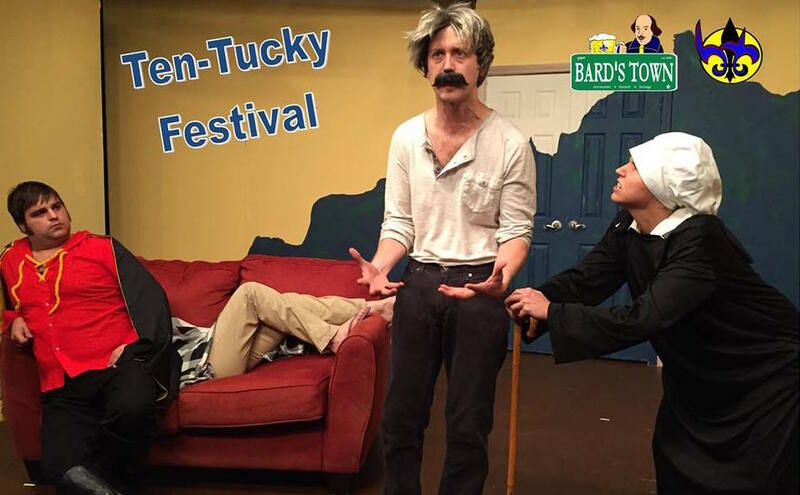 His work has appeared in Pure Uncut Candy, TheatreLouisville, and Louisville Mojo. 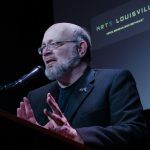 He is now Managing Editor for Arts-Louisville.com.